How do you respond to a letter? You take certain themes, expand on them, and answer certain questions. But how do you respond to… A COMPLICATED WEB OF PAPERS AND LIES? 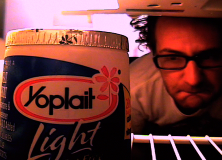 In Fridge from Vvinni Gagnepain on Vimeo. In Fridge from Andrew Gingerich on Vimeo. The basic structure of In Fridge is a warped mirror to I Got the Poops: We begin with some personal footage, then go to an internet phenomenon, later on we have a reference to the other filmmaker’s unpopular video blog series (“Diary of a Mad Filmmaker”, I feel, was more successful than “Vvinni’s Adventures Through Art School”), take a whacky detour with whacky titles, and go back around to do the whole thing over again before ending with a personalized message. And here, once again, we go into one of the heavily populated oases in the vast wasteland of the internet: Copyright Infringement. This segment of the tape was an infringement on the previous, the music (another internet favorite, thanks to David Hasslehoff) wasn’t cleared, the youtube videos were ripped, I knowingly took Andrew’s creative property and exploited it for my own nefarious purposes. Then I took this melange of copyrighted material and mushed it all together to create what would later be described as Soup. 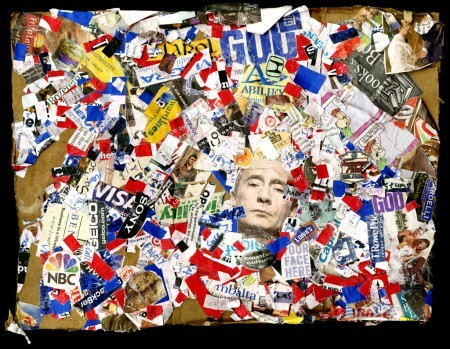 God, Putin, and any logos/company names I could find. Afterwards I sealed the whole thing up, included information for how to replicate the box, wrapped it up in a brown paper bag, and sent the tape off. You can read Andrew’s reaction to getting the package here. What comes next cannot be believed, so stay tuned for more from… THE COMPLICATED WEB OF PAPERS AND LIES. This is the story about a Tape. This is the story about A COMPLICATED WEB OF PAPERS AND LIES. 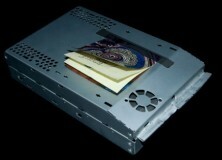 It was an aluminum harddrive encasement, sealed shut with duct tape. 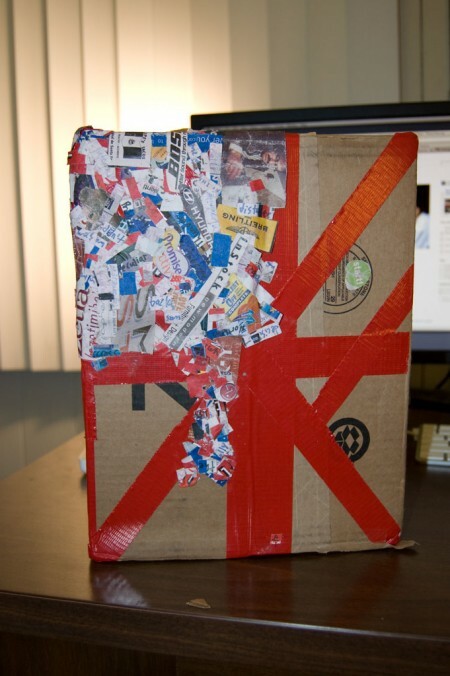 Inside were thousands of small papers that read “NO”, and another wad of wrapped duct tape hiding a Time Cube diagram. Inside of this wad was a VHS tape. A VHS tape that would become the source of pain, vengeance, and act as a microcosm for the entirety of the internet. There were also a bunch of sticky notes on top of the encasement. Here are a few. I Got the Poops from Andrew Gingerich on Vimeo. This laid the foundation for the installments to come: A smorgasbord of YouTube cats, our own footage (that would both be shot specifically FOR the Tape and that we had lying around), and Public Domain music, filters, titles, digital artifact, etc. 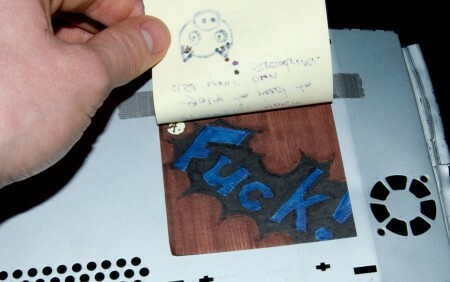 As I said above: The Tape acts as a microcosm for the internet and its culture. There’s a lot in this foundational video that’s kind of fun but not really engaging and some recycled meme-ing, but there are also some fantastic parts that are still triumphs (There is some fantastic sound design here that I didn’t really appreciate when I first received the package, and the 8mm footage of people walking on the beach grows into a terrifying tizzy when everyone starts walking IN SYNCH WITH EACH OTHER). It was a noble effort and an interesting idea, and I didn’t know what to make of it or how to respond. But I tried. I tried, and tried, and I came up with something. For more information on the creation of the “I Got the Poops” package, you can read Andrew’s write-up on it here. Stay tuned on the Henceblog for the next chapter of… THE COMPLICATED WEB OF PAPERS AND LIES.